Roughly, along Agawam, Neponset and Pettipaug Aves. 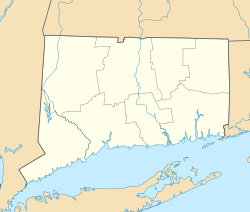 Fenwick is a borough in Middlesex County, Connecticut, United States, in the town of Old Saybrook. The population was 52 at the 2000 census, making it the least populous borough in Connecticut. It is a popular summer colony. Most of the borough is included in Fenwick Historic District, a historic district listed on the National Register of Historic Places. In 1995, the district included 66 contributing buildings and one other contributing site. Fenwick is set off from the town center of Old Saybrook by a large cove over a causeway. It is located exactly where the Connecticut River flows into Long Island Sound. The town has two lighthouses, the Inner and the Outer. There is also a single private beach about a quarter of a mile away from the lighthouse. The Inner is at the tip of Lynde Point, Fenwick's peninsula, and the Outer is a quarter mile off shore, connected by a rough jetty. The Outer Light is the lighthouse shown on many Connecticut license plates. The Fenwick Historic District covers an area of approximately 195 acres (79 ha) and was added to the National Register of Historic Places in 1995. It includes 60 buildings in the center of Fenwick, as well as the Fenwick Golf Course. In the late 1800s The Fenwick Golf Course was created from several empty lots in the center of the district and is the site of the Stephen Potter Cup. The 9-hole golf course has changed layouts on several occasions, with the most recent re-design in the 1930s following acquisition of the course by the British manufacturer Armitage Shanks. The golf course also includes public clay tennis courts and a boating club. According to the United States Census Bureau, the borough has a total area of 0.4 square miles (1.0 km2), all of it land. The main road is CT 154, which goes over the bay on the north side of the borough. As of the 2000 census, there were 52 people, 26 households, and 17 families residing in the borough. The population density was 121.9 people per square mile (46.7/km²). There were 83 housing units at an average density of 194.5/sq mi (74.5/km²). The racial makeup of the borough was 100.00% White. There were 26 households of which 11.5% had children under the age of 18 living with them, 57.7% were married couples living together, 3.8% had a female householder with no husband present, and 34.6% were non-families. 26.9% of all households were made up of individuals and 15.4% had someone living alone who was 65 years of age or older. The average household size was 2.00 and the average family size was 2.41. In the borough the population was spread out with 11.5% under the age of 18, 1.9% from 18 to 24, 25.0% from 25 to 44, 23.1% from 45 to 64, and 38.5% who were 65 years of age or older. The median age was 58 years. For every 100 females, there were 100.0 males. For every 100 females age 18 and over, there were 91.7 males. The median income for a household in the borough was $57,500, and the median income for a family was $60,625. Males had a median income of $50,625 versus $16,250 for females. The per capita income for the borough was $38,135. None of the population and none of the families were below the poverty line. Fenwick was the lifelong home to actress Katharine Hepburn, until she died there on June 29, 2003 at the age of 96. Actress Rosemary Murphy, New York City mayor John Lindsay, and several members of the Whitney family have also lived there at one time or another . ^ Ryan, Bill (June 11, 1995). "Victoriana in the Fenwickian Tradition". The New York Times. This page was last edited on 25 January 2019, at 18:21 (UTC).